From portraits to fridge magnets to video games, the Russian president's image has become a commercial venture. In the game “You Don’t Mess With Putin” for computers and smartphones, the Russian president features as the main character who fights hordes of zombies. "I came up with the idea of developing a game around Putin when I realized he is the closest thing the world has to a real-life superhero," the game's Belgian developer Michele Rocco Smeets told RIR. "I imagined that if a zombie invasion really happened, the only one who could save us would be Putin." The game, which aims to parody "Call Of Duty Black Ops: Zombies," also features a Russian character, Nikolai Belinski, and an American, Tank Dempsey, who argue constantly. "I’m a big fan of Putin personally and would definitely vote for him if he was electable in my country," Smeets went on to say. "My target audience is males from 15 to 30, but I’d like everyone with a decent smartphone or PC to be able to play this game. I’m doing a lot to make sure everything runs smooth even on lower-end hardware in order to reach as many people as I possibly can." According to Smeets, the game was originally scheduled to be released on Apple’s App Store and Google Play several months ago, but the developer was not satisfied with the quality and wanted to create "a more serious, top quality game with a lot of franchising potential, and that simply takes time." But as the Sochi Olympics approach, the game developer is eager to capitalize on the major international sporting event. "Before the start of the Olympics in Russia I want to release something, anything, even if is just an official trailer," he said. Incidentally, last year, Smeets released another game, “Run Snowden Run,” centered on NSA-leaker Edward Snowden, which featured Putin in a cameo. Aside from the video game, Russian gift stores are offering a range of merchandise related to Putin, from magnets to figurines and even decanters. "These are not mass-market souvenirs," a spokesman for the company Professionalnye Suveniry told RIR. "This is what state officials normally buy." He added that magnets featuring the Russian president, which retail at $2.50, aren't popular and are thus likely to be discontinued. Among merchandise offered by the company is "The Russian Federation's Most Recent History," a box in the shape of a book, which contains a decanter with a caricature of Putin painted on it, and three shot glasses in the colors of Russian national flag. The set retails at $40. Another local company is offering a laser-engraved, 3D portrait of Putin on a glass base, which is positioned as a "VIP gift to top managers, officials and politicians." Until recently, a Russian online store focused on figurines, offered a 4.7-inch tall figurine of Putin sporting a wrestling outfit. Made by the Spanish design studio Leo Kiri of tin and polystone, the "elite figurine" was offered at $1,820, and the description said that only eight of those had been made. However, following RIR's request for further details, the description on the web site was changed, reading now that the figurine is no longer available for sale. The internet store's spokesperson told RIR that only two figurines of Putin were actually made, one of which was sent to the President's administration as a gift, and the other one stayed at the design studio. Online stores outside Russia also offer merchandise focused on Putin. And although the range of items is mostly limited to mugs and T-shirts, some of the designs are quite imaginative. 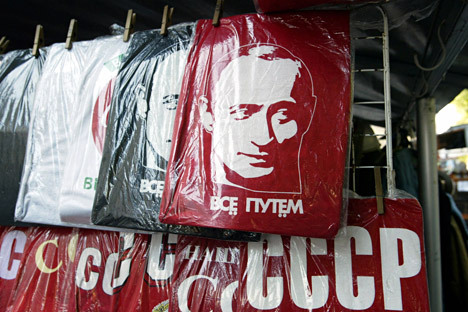 One T-Shirt, with a retail price of $23.79, parodies that of the fast food chain KFC, with a portrait of Putin, "KFC" replaced with "KGB" and a mock slogan reading "Putin Flavor First." Another one, which retails at $25.95 and apparently has been on the market for quite a while, features a portrait of the Russian President and the slogan "Putin 2012 for USA President."